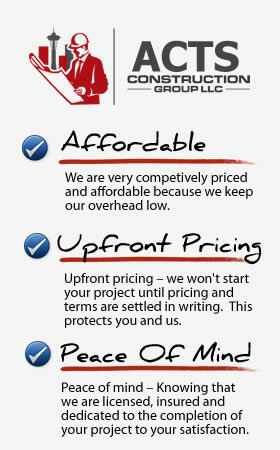 We specialize in drafting, design and engineering. Before a contractor ever breaks ground on your building site you’re going to need to have plans and design work completed and likely you’ll need the services of an engineering firm at more than one point in your construction project. ACTS Construction Group LLC is a full service general construction contractor based out of Seattle WA. We specialize in the drafting, design and engineering work required for most residential construction projects throughout the Greater Seattle area. From designing your home to engineering and installing the sewer and electrical systems we can do it all under one roof. When you choose to work the ACTS Construction Group LLC you are partnering with a team of construction professionals who have many years of experience designing, drafting and engineering residential construction projects throughout the Seattle area. You can be sure that you’re in the hands of professionals with a proven track record of happy customers.